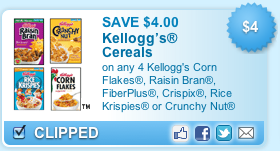 High Value Printable Coupon: $4/4 Kellogg’s Cereals + Target Coupon + $10 Rebate! Print this high value $4/4 Kellogg’s Cereal Coupon (valid on Raisin Bran, Corn Flakes, Crizpix, Rice Krispies and Crunch Nut Cereal). Use zip code: 34102 if you don’t see it right away. Can be printed twice. Stack this coupon with a $1/2 Kellogg’s Cereal Target coupon and score a fabulous deal! You can also submit for a $10 rebate when you purchase 10 boxes of Kellogg’s cereal. Thanks Cuckoo for Coupon Deals. Free 7-Day Supply of Youth Activating Concentrate! GOLEAN Bar Crunchy! Less Than $1 a Bar Shipped!